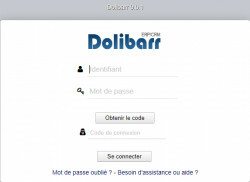 Module for Dolibarr to manage Training Center. This purchase also includes : - DocEdit module for Agefodd (Customization of your documents) - The public interface in which you can grant access to your customers. They will be able to consult and download their proposals, orders and invoices - 1,5 Training days (see terms below). Module for Dolibarr to manage Training Center. This new version includes a new interface much more user friendly. an authentication module has two steps to secure your data, it is necessary to add with a username and password another code that you must receive in your mail. FICHAJES is a complete SOLUTION to keep track of the hours worked by employees, and in a simple and automated way, you can perform the following operations: ENTRY, PAUSE, EXIT. The AzurSign module for Dolibarr adds a pdf printing template to propals for electronically signing the generated pdf, thereby shortening the print / sign / scan cycle. One of the possible usage scenarios: - Your representative comes to your customer with a quote/propal. 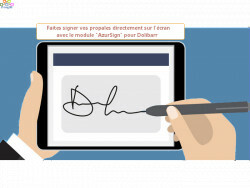 - If your customer agrees, he can sign directly on the screen, thanks to AzurSign. Thanks to the module: Management of breakdowns and maintenance you can assign all of your materials (product, article) internal or external to your employees, generated a state of assignment of materials, then you can manage the list of breakdowns, interventions technicians, spare parts and solutions suitable for breakdowns.